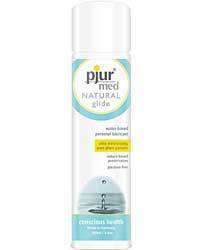 Manufactured by: PJUR GROUP U.S.A.
Pjur Med’s Natural Glide is a naturally formulated water based lubricant of the highest quality: pure herbal glycerine gives additional moisture and guarantees long lasting lubrication, as well as caring for and protects dry, stressed skin. Dermatologically tested for hyper-sensitive skin. Safe for daily use. 100ml.